Clear kitchen clutter and give yourself more room to prepare your meals with the Original Copper Cook Square 6 in 1 Pan Set. Traditional kitchen cookware has always featured a circular design. The Copper Cook innovative square design provides an incredible 27% additional cooking surface area versus the traditional round pan. This means you can cook more food at once or have added space to maneuver your cooking utensils. Does a square pan cook better on a round burner? Yes! 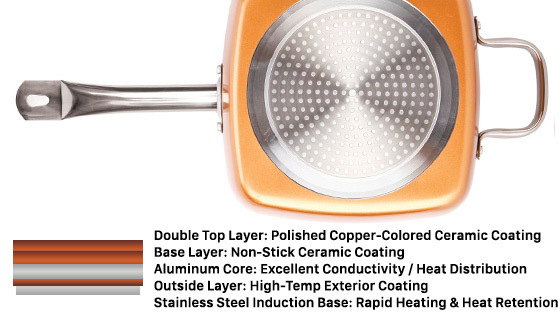 This copper pan has a built in stainless steel induction plate. The induction plate on this pan evenly disperses heat and is fully compatible with gas, ceramic, electric, or induction cook tops. Versatility...this 6-in-1 pan will allow you to get rid of so many other pans in your kitchen cabinets. This single pan can replace a roasting pan, deep-fryer, saute pan, steamer, baking dish, and frying pan. You can also go straight from the stovetop into the oven up to a temperature of a scorching 550 degrees! Efficient Cooking...The induction plate evenly distributes heat throughout the surface of the cooking area which eliminates hot spots. Eggs, pancakes, grilled sandwiches, and other favorites cook evenly no matter what part of the copper pan's surface area they are sizzling on. When you combine even heat with a polished non-stick ceramic coating, you get this exceptional nonstick pan that doubles as a deep-dish sauce pan, nonstick pot, and baking dish. 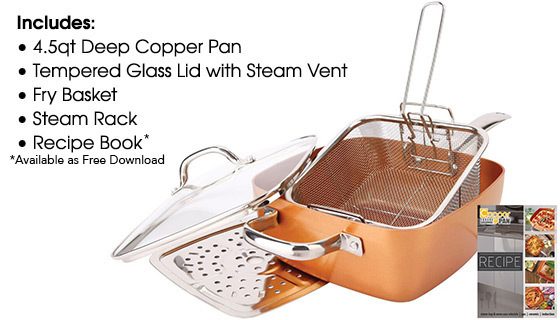 Set Contents include: Square Copper Cooking Pan, Tempered Glass Lid, Fry Basket, Steam and Roast Rack, and Steamer Tray Stands. This pan is the greatest. Have used it to make soups, roast beef stew, pot roast. It is a pleasure to use and the cleanup is a snap. Made sauerkraut and ribs last night. Cooked food perfectly and rinsed clean when done. My mom loves the copper chef pan we purchased for her. She has over 50 years of cookware collections including saladmaster and has tried lines from Martha Stewart, Rachel Ray and most recently Pioneer Woman and Pampered Chef. Currently the main cookware she has used since the purchase has been the Copper Chef. Stating just the other day how she wished all of her cookware was made the same way. Kudos to those that designed the most easily maintained cookware my mother and I have ever purchased. I got my product on time but the pan was scratched. I sent an email to the customer service and got response right away, they said will send me a new pan and I got it now. What an amazing customer service! WE LOVE THIS COPPER COOKWARE, JUST WHAT WE NEEDED !!!!!!!! NOT ONLY IS IT EVERYTHING IT WAS ADVERTISED TO BE BUT THE PRICE WAS RIGHT ALSO, GREAT DECISION ON THIS PURCHASE !!!!!! I love this pan. It really is completely non-stick. Cleanup is super easy! Square Copper pan set- Great! I love using my copper cookware! The price was good too! I love this pan because it cooks evenly and is easy to clean. It is very versatile. Love the stove to oven thing. Used it as a Dutch oven to make bread at 450 degrees and it worked great. Bought 2 more as gifts and suggested it to a friend who bought one too. I put 2 rib eye stakes in this pan without greese and they did not stick. They browned down nice and cooked to perfection. They were delicious. Im having a great time basically being able to utilize this one Copper Pan, which seems to meet most of my cooking needs. And the clean-up is as easy as a swipe of a wet cloth, 1-2-3! Throw out all your other pots and pans! I love this pan! I use it everyday, and it has replaced all my other favorite pans. So versatile, it does everything. Best purchase ever! Love these copper cookware pans. Cooking is easier and clean up is amazingly fast. This square pan makes cooking casseroles and like dishes so easy. This pan is so amazingly useful, efficient and easy to clean that it surpassed everything I had hoped for. I intend to start buying what is available until I own all of the Red Copper dishware there is, and then my kitchen will be complete. Bought this pan and love it. Love the fact that itâ€™s nice and deep. Use it almost daily. 4-Pc Square Copper Cookware Pan Set is Great! I have not used it but one time but so far I like it very much. It is deep and cleans easily. It was a little smaller than I expected but it will do the job nicely. This is an incredible addition to the kitchen. You can do everything with this set fry foods, steam foods and doing everything else you can possibly think of AND ABSOLUTELY NO STICKING. A must have for the kitchen. This was a gift for my daughter-in-laws birthday. She said she loves it. Fried up some deer steak, using the basket. Worked great and cleaned up easy. Excellent cookware. Foods cook evenly, great non-stick quality ans clean up is a breeze. I absolutely love my cookware. I like this pot when it first came out but I couldnt justify paying $75 for it. So glad I snagged it on hear at a good price. I like deep frying it it with the little basket. This is my 2nd set! Ive enjoyed using my 1st pan set for quite a while now! Ive used atop of my outside grill, stove top and for baking purpose in the oven. One of the best things going for it is its lower price. I paid $79.00 for my 1st set! From the moment the 4pc Square Copper Cookware Pan Set arrived at my door my wife was very pleased. The product description and presentation was just like it was from the advertisement. We have yet to cook with it but that is forthcoming. I love my item,I cook with it every day!! I want to order another one! Thanks guys!! I have been interested in the copper pan for a few years but felt $59 was too much to spend. Was given your web sight and found them for $29.99. Fabulous so I immediately purchased it. Used for first time today in the oven and it worked great. It was my belief that the item was bigger. When I saw the video gave me that impression. Purchased 2 sets for myself and 2 others as gifts. Definitely need to use Pam or other kind of non stick product prior cooking. The other problem is the bottom is a little concave and does not have a flat even heat surface. So far I use these pans every day for over 1 year, its not perfect, but the price makes it a good deal. I have bought at least 10 of these as gifts. Ive been using it since last year and everyone is sick of me talking about how great it is. Never again. Oil burned before it came up to a smoke point. Lid doesnt fit, so when pouring out liquid items fall out. Would rate it zero stars. If you cook a lot like I do, You will love the ease from stove top to oven and clean up is so quick!!! This pan is the BEST pan Ive had in a long time. The price is right and the quality is great, what could be better. This set arrived quickly, Thanks to Pulse for a Great buying experience!! Product not as good as pricer copper chef. Doesnt heat as fast on induction burner. So its ok. Can be used on regular cook top. i have been using this pan and accessories and i love it. everything they said it was. Great pan. Can make a whole meal in it. Super easy to clean. This is our second copper pot and we love them. Getting them at Pulsetv at the lowest price is the frosting on the cake. It came with scratches . First use was Sauteed onions, adding scrambled eggs, then tomato soup for a Spanish Omelet. All went well. Second use, using butter and frying eggs. Eggs stuck to pan. Third use more eggs also stuck to p[an leaving a mess. Did clean easily though. Id been wanting to buy the square copper pan from the first time I saw the TV ad. It looked practical and convenient, offering many possibilities, plus it makes cooking fun again! These pans are really great to cook healthy foods you need no oil nothing just cook. Easy to clean they are just awesome pans. I loved this so much I ordered one to be sent to my brothers wife - who does a LOT of cooking. She loves it also! We have never loved cooking so much. I bought three sets of the Copper Chefs at Christmas time, one for myself, one for my daughter and one for my niece. We all love them and would like more however we sometimes need smaller sauce pans and regular size pots. Love the square fact just need different sizes for smaller families but dont change a thing. The square copper pan is Awsome, really cooks well, with no stick. Im very impressed with how this cooks and cleans up! Im very pleased with everything Ive cooked in this pan, and the cleanup is quick and easy. We love it. Cooks great and so easy to clean. I threw out a lot of my old pans cause this one does it all!!! very useful and a good buy!! I have found many uses and love the non stick. I hope it lasts because now it is the best non stick I have! As advertized, non stick & versatile. Very happy with my purchase. Everything you expect it to be! Everything fits and works as advertised. This will become a popular item in my kitchen. Ive used this every day since it arrived. Everything from stove top to oven. Just gotta be careful since the handles always get hot! Very easy to clean. Bought it for my girlfriend. And she loves it! Love it clean so easy thing do not stick. Fun to use. Easy to clean. The best cookware I ever had. Will not stick or scratch. Love it!!!! Love our purchase and the amazing customer service. The product is good and arrived early. For the price and quality shop at pulsetv.com for cookware. I LOVE my copper pan! I cook everything in this pan. It is so easy to clean. I would definitely purchase more! My wife and I love this remarkable outfit.We have made pies and cakes ,apple fritters and French fries. All have come out ok.
LOVE, LOVE, LOVE them...great price and great value. These pans are awesome! 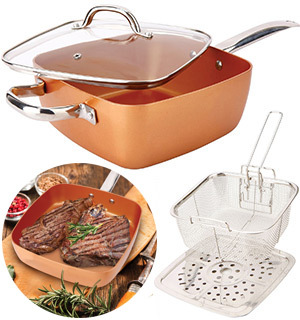 We enjoy using the 4-Pc Square Copper Cookware Pan Set. Everything as advertised except the seasoning necessary for the pan to be at its full potential. some stains from the oil may occur but that will not effect the pans miraculous characteristics. Very pleased with this product. 4 Piece Square Copper Pan a Hit! This was a gift for my daughter and her family. She has been very impressed with the size and quality of the pan and accessories. I wish Id purchased a 2nd pan at the time they were available! I like pan. It is deep and pretty wide. I seasoned it per instructions and nothing sticks. Im not a person that usually Steam food but this pot gave me the incentive. The fry basket has several handles and supports spot welded to the basket. one of them was loose and came of in the shipping carton. The non coating on the pan was not as advertised and had different instruction for seasoning the pan for use and types of oils to use for cooking. I purchased another pan from the website that was selling them on TV and that is how I discovered the differences the two pans. They both had the same box same baskets and steam plate but different instruction sheets on using the pan itself. The advertisement for the pan on TV states that there is no oils or lubricants needed at all and the one I received from Pulse told you to use oil or butter while using it and to season the coating as described before use in the supplied instructions. I dont think it is a Pulse TV problem but with whom ever supplied them with the pan itself. You can see a difference in the coatings of both pans. Seen it advertised but it was too much.Price much better but its not very thick.With this in mind it works well and really is a non-stick pan. As of this writing Ive used it over a dozen times.Go head and buy it. the pan will scratch. It is not at all as durable as advertised. Such exaggeration. Never use metal utensils with these products. Even when being super carefull if stirring,flipping or mixing, these copper product pans will scratch and loose the non stick feature.Already disappointed in my new pan I was so anxious to receive. The major benefit is the ease of cooking with this cookware. Heats up quickly and heats evenly. Plus it is very easy to clean--no scrubbing necessary. Im crazy about this pan.It delivers what it promises.Its the only frying pan youll ever need! Bought this for my mother who saw it on TV. She absolutely loves it. She said it performs like they said on TV. She said nothing has tried to stick and cooks evenly. Highly recommended. I really love this product, it does everything it said and more and 20 dollars cheaper than other advertised prices. Up side: This cookware cleans up like no other cookware Ive ever used.. Convenient to use in oven or on cook top. Down side: wish it included a cookbook. Has worked well for me. Important to wipe it out while it is still hot. Appreciate getting items at a reasonable price instead of paying for the commercials. So many uses, a complete unit. Cleanup a breeze and most of all I love it. It worked fine but once I had something stuck and when I used a scrubbing sponge on it That was it. the coating is so thin that now everything sticks so I threw it away. My daughter loves it! This was a gift to her because we have one and it works perfectly. I saw the wonderful price and decided to make the purchase. The cookware is so practical and works, just as it is advertised. This is my fault, I am sure. I thought there would be a cookbook with this product but there isnt. Oh well. I have only used the pan, lid and basket. They seem to be of nice quality. Sturdy, but lightweight enough to not bother my arthritic hands. I am disappointed that the basket handle doesnt lock as easily as it should. It does work fine when there is weight in the basket, though. I give this 5 stars for the product and the company. This is an excellent pan. Ive steamed veggies, baked a roaster chicken & used the basket to make french fries. Everything was perfect. Both my and my partner love the copper fry pan. I do have to use some oil spray every time to keep things from sticking but that is ok with me. Easy clean up. My wife had the frying pan first and liked it, so she had me order this square pot. She likes the pot, but has not used the basket or other piece. The non-stick feature works pretty well. If you cook some things with sugar in them it takes a little bit more to clean. Otherwise it is a good value. It is great. The pan was a gift for my mom....it arrived and she has been cooking great meals. This pan does exactly what it says it does. The only negative is that it doesnt come with the recipe book that is shown from other vendors. Great product. Does everything claims . However I have found it for $14 less . Arrived when expected. Be sure you follow directions before using the first time. Works exactly as described! I cooked eggs and they slid right out of the pan; no sticking, no broken yolks - perfect! I also made melted parmesan crisps and they also slid right out of the pan! I love this pan! The pans non-stick ability is impressive, but it seems to wear off after several uses. The pan also seems bigger until you receive it and the steamer sits in the pan pretty loosely, veggies fall off the sides into the pan. Other than that, for the price, it is a good deal and I enjoy cooking with it. The best thing ever. Bought others before for gifts so this one is mine. I have always hated to cook because of the way my meals would turn out, but I am having great results with pork chops, bacon, chicken. I bought one for myself and my sister. I have not used yet but she has and is very pleased with it. The only concern is that she was expecting a cook book to help with dishes that sh could use such as how to cook lasagna and spaghetti. Is there a cook book with lots of recipes in it? This the perfect all in one. Truly! Nothing sticks. My son used 1 night to cook and said It was the bomb! I love it. Ive been cooking in it since I got it. More than I expected. Deep enough to deep fry in, steamer tray works very well, I really like the glass lid, and the metal hand allows the pan to be used as a casserole dish in the oven. BEST of all the clean up is like Magic! I gave this to my daughter because I received one for Christmas and I just love mine. She was very pleased with the pan. I love my new 4-pc. square copper cookware pan set. It is so easy to clean and cooks great food. I do really like this pan. The accessory fry screen is a great benefit. I love the size as it helps keep clean ups to a minimum. No pan is completely non-stick and this one is no different. keep temps down and the non-stick feature works pretty well. I bought a set for myself for Christmas and bought another for my daughters birthday. Totally awesome cookware, love the recipes. Easy to use, cleans up wonderfully. Highly recommend this cookware. Nice pan, by the time you add shipping, no bargain. LOVE the pan! Very easy to clean, works with great ease! WONDERFUL product...fast shipping. Just as advertised. Wife is very happy with it. Wish it would have had the recipe book with it. It arrived on time, well packaged and as advertised! I was pleased to find it as the price was half what other sellers were asking! I purchased two for the price of one! I ordered this twice. I love it,it is equal or better than the more expensive version. I gave the second set to my daughter and she loves it,her husband is a chef and he uses it all the time and says it hold up to its guarentee. Absolutely love it. Price was great. great pan,very little clean-up. I made caramel sauce in it and the clean-up was a breeze. Great pan! Light weight, easy to clean, no oil needed. I received my pan about 3 weeks ago and I havent stopped using it! Ive made stove-top meals and used it in the oven to bake and roast also. It is well worth the money I spent on it, and it cleans up well too. I highly recommend it! I love my fry pans. The advertising on TV is absolutely correct. It is a pleasure to own and cook with this pan. The clean up is so easy.. So far this pan has lived up to the hype. I seasoned it first as instructed and no oil is needed, unless you choose. Things do not stick and cleanup is a breeze. I really like the versatility, easy to clean,and size of this pan. I dont claim to be a gourmet cook, but this pan makes me look good and the meals taste wonderful. I especially like the fry basket. I have only only used once so far but it Frys chicken great and no greasy mess on stove. Love it. Exactly as advertised. The copper pans are great for cooking and clean up like new. They dont burn or scratch. Pans are great for cooking . My only beef is that both of them arrived flaked on the insides with some areas brownish and others fading. The pans need to be both replaced. I would still recommend them. It is great and everything I hoped for. Customer service was wonderful, as I needed the basket replaced. It was done with no hassle and no wait. Everything was wonderful and I am more than pleased. I have really enjoyed my 4pc. sq. copper cookware Pan set. It has actually surprised me I did not really need any or maybe just a drop or two of oil. My objection was there was not a booklet with recipes. The pan arrived in a timely manner. It was exactly as advertised. Have used it a few times now, and so far perfectly happy with it. Would recommend it. Love it. It is the right size for so many things I cook and many times, I dont need any other pans. Highly recommend them. I have found this square pan to be everything claimed in the propaganda. I cured it as with other pans of this nature, and have fried foods without oil or butter, and to my surprise nothing sticks to it, and cleanup is a breeze. I had to have one of these! Saw the ad enough times and there had to be one in my kitchen! Its a great vessel, Im looking forward to getting very creative with it! And, it looks gorgeous hanging on my wall! This pan is AWSOME!! It is now the family favorite. No oil needed, just cook and go.This is the best thing since sliced bread! This non-stick pan even repels water while Ive been washing it in the sink. Ive made three different meals in it so far. But pouring frozen Chinese meals and dry rice noodles all together, adding some water and putting the lid on and walk away for 30 minutes...without anything getting overcooked or scorched was AMAZING. Looking forward to using it in the oven to bake cornbread and roast some Cornish game hens. 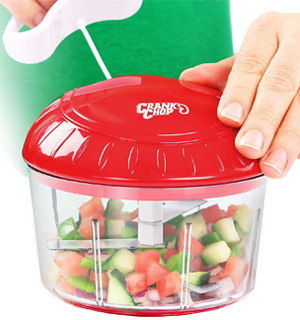 Easy to use Easy to clean! Performs just as promised. The non-stick surface is excellent when cooking, and cleans up without effort. I love my copper cookware. I use it every day and it cleans up very well. I bought one for my daughter at Christmas and she liked it so well, I bought myself one. I have used the pan twice and really like it....wish it was alittle deeper for frying! This is the most amazing pan that I have ever seen. I cook ALOT and I have never had a nonstick pan like this! And the price is incredible compared to the ones you see advertised on TV for double this price. I just ordered my second one from Pulse TV!!! I bought this for my son and he loves it. I have the whole set and couldnt be happier. They do exactly what they say and are a snap for cleanup. I love this product and cant stop talking about it! The skillet was stick free , but on my induction cooktop , the corners did not maintain the same temp as the round induction plate, so it browned unevenly. This pan is totally awesome. I do wish it was a little bigger, but I really do love it! I ordered this pan for my son and he loves it. I already have one and I too love it! I did not realize the glass lid could NOT be put in the oven...limits its use! And the cookbook could not be downloaded in a legible condition. Otherwise...O.K. I am only giving this pan 2 stars due to the fact it is smaller then what I expected. Nothing sticks as advertised. Good Price. Very Satisfied. I love this pan. Its light weight. Never sticks. So easy to clean. The pan is great, however, I never received the FREE cookbook as advertised.. I have used this pan several times since I received it. Cooked pasta, made chili, used as deep fat fryer. It is great. The size is really nice. It has worked great every time. I would recommend this pan set. Price was great, too. Used it nearly everyday since it arrived. This pan cooks as great as it is advertised but it is easily scratched. My granddaughter used her fork to try to remove cheesy hash browns and it left a scratch mark on the bottom. Im very disappointed! This pan is everything they said it would be. Perfect. Love it! I like the high sides and that I can use it on my induction cook top. Quality is not the best but thats why it is inexpensive. Basket is great for pasta for two but uses too much oil as a fryer. Love it I purchase four of them. One family or each of my children. I just retired last month and am in the process of downsizing. This is a multi-use cooking set that fills the bill. I love the square shape. It truly is non-stick and clean-up is a snap. I saw it on tv, but I didnt want to pay that price. This was still a little more than I wanted to pay, but Im seeing it is well worth it. Love it. Works great for everything from meatloaf to pasta. Cleaning is a snap! 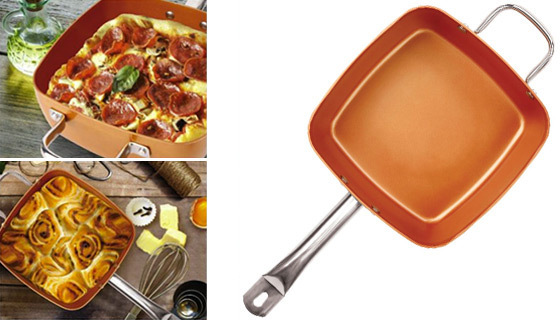 4 Piece Square Copper Pan Saves You Money! Wow! Since I bought the Square Copper Pan, Im down to almost one pan. Seriously! I do almost everything with this pan. First thing I discovered is that its high sides prevent sizzle splash all over my stove like most frying pans do. The heat ring on the bottom distributes the heat evenly over the entire surface meaning I can cook at med-low now instead of med-high which will lower my gas usage! Even the deep fryer does French fries light golden color in Canola oil and they dont stick together. Tempura and fried Chicken come out perfect every time because the heat is so well controlled. I steamed some Broccoli, Cauliflower, and green beans and they came out perfectly al dente. Just one more thing: BE SURE TO FOLLOW THE INSTRUCTIONS ON SEASONING YOUR PAN WITH VEGETABLE OIL! This is an important step to insure that the surface is really properly prepped for use. I recommend this pan highly and it is $20 less than the Red Copper model! Everything cooks so well in this pan. Its my new go-to pan for everything from fried potatoes, to chicken dinners, to steamed broccoli - you name it, this pan cooks it well. Ive even used it in the oven for a small lasagne, crusted mac n cheese, and my apple cake. I REALLY ENJOYING MY COPPER PAN AND THE PRICE IS GREAT. Makes great popcorn. Fried fish in it first night; excellent. My favorite pot in my home. I cant believe the convenience of this non stock pan for cooking recipes on stove top and oven. I plan to order another one! So many of these type thing dont work but this one is fantastic. I have deep fried french fries and ground beef....IT WORKS! This pan is so perfect for many things. I have sautÃ©ed vegetables, chicken, fish, etc. and it all works so perfectly . I hardly use any other pans in my cooking. It is a little smaller than I expected but otherwise wonderful! Great nonstick surface makes it great to cook in and easy to clean. Pan lived up to expectations. Large enough and evenly cooked food. Like the glass lid so I can monitor cooking. Well worth the money. Love this pan,cant wait to use it. LOVE LOVE this pan. The only thing is I wish they sent me a cook book with it. I dont mind as I make up most of my dishes anyhow. Thanks for the great price. 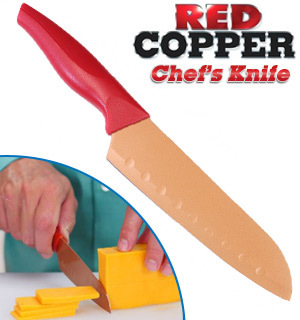 I bought this for my partner who is a Chef, she loves it. copper pan! I bought one for each of my daughters! fabulous! They love them! Purchased this with reservations but wow it is as advertised. Fantastic purchase both product and price. I have had this pan for about 2 weeks now and am loving it. To the lady that didnt know what the clips were for , they clip onto the bottom of the steamer rack so your food is steaming , not sitting in water. i love this pan because i can deep fry in it or use as another skillet or a steamer. 4 Piece Pan Set I did not receive the Cook Book. Delighted to have the magical square copper pan in my kitchen. Its now my go to pan and its irresistible. You get what is advertised. Its non stick, cleans up beautifully, works great for frying, deep fat frying, and steaming. I especially like how I can move it from the stove top into the oven. I only gave it 4 stars because the cover doesnt fit down on the pan when you use the basket. Have the small square pan and love it so purchased the deeper one to be able to cook larger meals and I love the glass lid fits on both products. Much better than a Teflon pan. This Pan lives up to everything they say on the commercial. Im very happy with my purchase. Im even thinking about getting the other pan thats the same size but the sides are not as high. This pan replaced several pots and pans I normally use. I highly recommend this pan to everyone. Good solid pan easy to cook with, easy to clean! Doesnt stick, easy clean up too. Pan is definitely nonstick. All pieces Re high quality any you wont find a better price. Perfect. Just what I had hoped it would be. Product is super. Can make almost anything in this product. Clean-up is a breeze. So nice! It was a gift. I saw it after the lady opened the box and it was exactly as advertised. Chicken dish never tasted better. Perfect golden brown and so easy to clean up. Very nice cookware, although it does tend to discolor on the bottom rather quickly, even if it is used on induction range top. I have only used the square pan and lid and not any of the other pieces. I did like the way the pan performed, no sticking. Only problem that I have with it is that for some reason, I thought it was going to be bigger. easy clean, fast heat up, induction ready GREAT BANG FOR THE BUCK !! Love this copper pan, easy to use, its efficient and clean up is as described. Seller is A+++, item received in timely manner, and was package nicely! Thank you, and price was right! I gave this pan to a friend for Christmas. She loves it! No stick. Stove top and oven safe. I LOVE THIS.ITS A GREAT PAN.YOU MUST HAVE IN YOUR KITCHEN.WONT REGRET IT.LOVE IT!!! We only wish we had the 11 inch instead of the 9.5 inch square. So go big! I love it, it does everything they say it does. Love it. Easy to clean. Easy to cook in. Nothing sticks. best price I have seen even though I had to pay shipping. Cooked a roast pork stew and it came out perfect. Family loved it.So easy to clean up. No mess one pot pan, and it goes from stove top to oven. 5 stars! Induction does not work well. My husband loves this pan. Even though it was a bit late for his Christmas, he didnt mind. works great for frying ! So far it works as described in the advertisements. Granted Ive only used it twice since having it, but Im hopeful itll last. It is much lighter than expected so obviously, it is not made of copper, but aluminum. For the price I think it is an excellent deal. So far it has worked great with little cleaning required. Allows searing of steaks and chops with no pan stick. High sides keep splash inside which is great for a white glass top stove. Very light and bottom is flat. As advertised. Happy with the pan. I really like my new pan. Never before have I been able to make 4 grilled cheese sandwiches at the same time. It cooked evenly and quickly, which liked. I would recommend this pot to everyone. Cooking surface good. Clean up, not so great. I tried out my new pan with a steak and roasted vegetables. They cooked great. When I started to clean up, the interior of the pan was as advertized. It almost wiped clean with a paper towel. The handle, however, had been spattered in the oven and did not come clean on first attempt. I also noticed scratches and a white spot on the bottom of the pan. I dont hold much hope for the life of the exterior, but the interior lived up to its promotion. Received this as a Christmas gift but havent had a chance to use it. Four stars because in the video it says that the one I received comes with the receipt book, but it didnt. I did download it, but prefer a book I can put on my counter while cooking. Dont want my computer on the counter top. Only used it once so far but it was great! Hope to use it some more and check it out! would recommend it to every one. Great product. This is much nicer than I suspected. Plenty large, yet lightweight. Saw the same pan at A local discount store for twice as much money. I got this as a Christmas gift and made baked beans and I just wiped out the pan and it was clean. No scrubbing no soaking! Used for frying and it was great. My only concern was after receiving it I saw it was not the one that I had seen advertised on TV. It didnt come with an instructions or recipe book. There were metal clamps in the box and I dont know what to do with them. Food doesnt burn, easy cleanup. Just ordered the copper skillet. I love the Copper square pan. It cooks just as advertised. But I am disappointed that the size is a bit too small. I though it will be bigger! Love these pans! I have been putting them through their paces since someone told me they were junk!!! I have bought more pieces and am packing away the stainless! It is just too much hassle to clean and keep shiny! I have been cooking and baking in it and love it! I am so pleased with this pan. It is everything you said it was. This was a gift we gave someone. She asked for it and seemed to love it as she removed it from the box immediately after opening. I had to email to ask about the shipping status but once it shipped, it arrived quickly. The description lived up to all the kudos..at the moment Im preparing my special soup for lots of people and I have to make 3 batches ..but being a scientist, Ive prepared the fixings for 3 batches and as one is done it goes into the slo-cooker to keep warm. Who cares, cest la vie! I was able to use metal utensils without scratching and it cleaned up to perfection...nothing stuck. It definitely lives up to its claim. LOVE IT! So happy this can be used on induction stove. It is a great size and deep. True to advertising, nothing sticks. Would recommend it. Love it I have the cooper skillets. The copper pan is great and so is the price. Ive already used the deep frying part of this pan and it cooked fabulously. However, I didnt receive the 4 legs to the steamer. Im hoping they can send me a set. I also didnt receive any kind of instruction book. The pan it self is awesome and the clean up was very easy! Ive recommended this pan to several of my friends. Works as shown on TV for half the price. I am enjoying using this new pan because it perfoms as shown on TV for half the price. The only thing I would have liked was a how to take care of the pan page. Completely satisfied.....excellent quality,great price, quick delivery. Highly recommend this purchase. This pan works flawlessly as described. The steamer support is especially handy. A little smaller than I expected but still very useful. Good looking cookware with many uses. 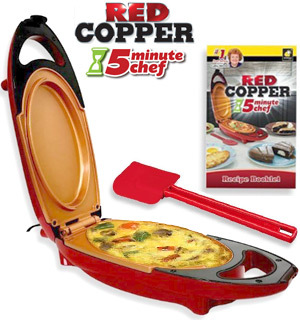 Was disappointed in not receiving The Red Copper Cook book - Do you think you can offer the cook book at a later date? Nice pan set at a much more affordable price than found elsewhere. Not very happy. The handles were poorly attached and the copper coating is coming off from the bottom. OUTSTANDING!!!! My wife loves it and if I ever get as chance to use it I will let you know what I think about it!!! Very happy with this product it arrived on time in good shape we havent had time to use it as we are on the road but plan to put it to the test very soon! I couldnt wait to cook in this new copper pan! It is everything they said it was, it works great with my induction cooktop! I love the squart cookware set. So easy to clean up. I am extremely satisfied with this purchase. I used my new pan and was amazed that nothing stuck to the bottom while cooking. Used a paper towel to wipe residue from the pan. Great pan!!! Everything was great about this pan except for the fact that the small handle on the side of fry basket was just loose in the box when I opened it. That doesnt affect the usage so its not a major problem but I cant, of course, give it 5 stars. This pan is all that it was advertised to be. My husband drooled over it ridiculously when it was show on TV and when he had it in hand he was absolutely grinning from ear to ear. Only problem is finding a place to store while not in use. Im absolutely thrilled with the purchase from pulsetv.com of the square copper pan. The price was about half of other sites and its the exact same pan. The only disappointment was the cookbook wasnt included. I dont need the recipes but the instructions are a great way to get familiar with the new pan. 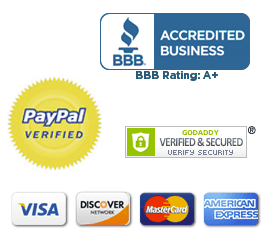 $$$ less that other online sites for the same product. Very nice pan and accessories. Have only used it once. So far, so good. Not as non-stick as I would like! Cost was less than the RED one seen on TV. Should do the job for much less. Love,love,love it. In one day I cooked three meals in it. Cleaning in between each meal was a breeze. Good looking but square bottom is impractical on a round induction plate. I love this pan! I may never use my other pans again, in fact its going to replace several of them that are not in good condition anymore. Anything I want to cook, I can do in this pan! This is a wonderful pan. And such a great price. I love pulse tv!!!! Best pan EVER! I bought the first one from Copper Chef for $75 and it is the exact same product. Great to use in the oven. Grills vegetables to perfection and then just add the rice. So versatile that with two pans you cover a complete meal. I love this pan! 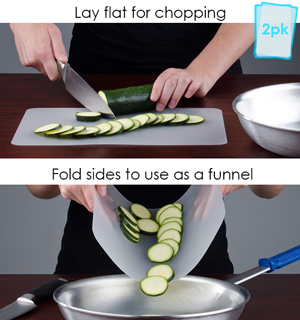 Food slides off and it is so easy to cook with. This pan is exactly what I expected and at such a great price. It is heavy duty, sears meats nicely and great for roasting in the oven. Cooks evenly on my ceramic cook top. This is a whole pan set in one. I love it. It cooks pasta perfectly and deep fries great and steams, bakes and etc. etc. it never scratches and you can clean it with a paper towel.... Hey what better can we ask for??? I love the way this pot cooks, nothing sticks, its amazing! Its so easy to wash afterwards too. The shape is especially nice to cook meals in also. Looking forward to baking in it also. Luv it! Everything we expected & the price was GREAT!! The Square Pan works great. Great appliances, but there was no recipe book. There is a downloadable instructions and recipes version, but no book. Pulse TV was nice enough to mail me a copy, as I was unable to download from the site, but it was still not what is in the recipe book offered by square Pan. I wanted the recipe for barbeque country ribs with cola, but not in what was sent. Pulse TV folks always great to work with and there for the customer. So far the pan is everything you said it was! Nothing sticks, cooks evenly, have used it stovetop and in the oven and very very pleased. Everything thats been said is true. Girl friend loves it now I have to get one for her mom. This is a great pan!! I know you dont need oil or butter, but I add a little for flavor. So easy to clean. I love the high sides. A little worried about scratching it, but I havent yet. LOVE this pan use it almost every day ! Very pleased with the copper pan. Have used it several times. 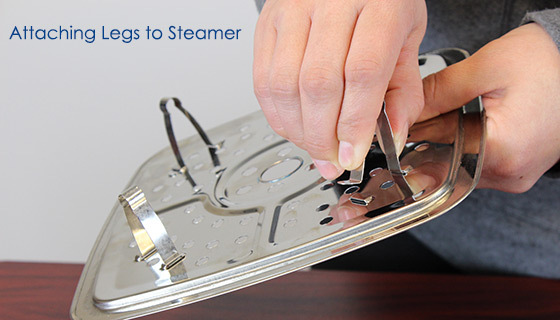 The steamer insert is nice and works well. Only thing negative is its pretty light and a little cheapy. I doubt I would have bought it in a store. But overall, were happy. Tks. What a great pan. Absolutely does everything as advertised. Nothing sticks, large enough to do a family batch of stew, a cake, brownies, steam vegetables, deep fry; use on the range top or in the oven. I am very pleased! My sister saw an ad on late night TV and wrote all the info for me. Then I saw this ad for $20 cheaper and free shipping. I got one for her and one for her daughter. They both rave about it almost every day!!!!! Awesome Christmas gift for the cookers in the family and friends!!!! Thank you for a great pan! I love my square copper pan.The shape makes it easier to fit a meal for a crowd than regular round or oval pots.And it is tall enough to be used as a deep fat fryer.The handy steamer and lid make this my go to pan for many dishes. Baking sticky buns or a chocolate cake has never been more fun because with the non stick coating,cleanup is a breeze. I love this one as well as your other copper pan. These are the best pans Ive ever, ever used. This product is nothing like what is on TV.. Its very small and the basket is very cheaply made.. The TV Pan says it can cook 4 sandwiches @ a time, doubt this one can fit 2 cut up sandwiches.. Not worth the money..
A Real Blessing in the Kitchen! I bought this for my wife and she loves it! She cooks everything in it and rinses it out when shes done! And I no longer have to scrub forever on expensive cookware when she, shall we say, cooks too long on the stove!